Willoughby Council has a long term plan to provide a footpath (at least on one side of the street) for very street within the city. 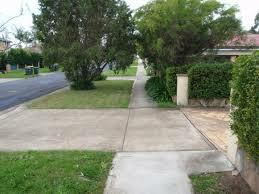 Current projections indicate that there are 95 footpath projects with a projected cost of $2,098,451. Usually, $100,000 is allocated each year for these planned works. So achieving the goal od new footpaths will take over 20 years. Each ‘missing link’ footpath segment has been assessed and ranked. The highest ranking West Ward segment is for Hinkler Crescent East side from No. 1-19. However, this is unlikely to be addressed until two years time. However, it would be then maybe ten years before the Ward’s second highest ranking segment would be looked. A full list of the planned footpath segments is available on the Council web site.